Cosy, clean, neat hotel, tasty breakfast, place is very close to Hammersmith subway station ...and most of all very friendly and kind staff. I tu gÅ‚Ä™boki ukÅ‚on w stronÄ™ Pani Alicji, dziÄ™kujÄ™ bardzo ! 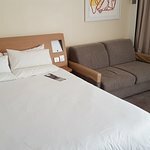 Me and my family had a pleasant stay at Novotel London West this Easter holiday. Online check-in went but they gave us another room quickly . Breakfast was good. Special thanks to staff member Meri for your hospitality that made our stay extra special. We are already looking forward to visit again later this year. Last Wednesday night (17th April) we visited London West Novotel for a most delicious Buffet Dinner, to celebrate a special birthday after having done so before some 5 years ago when we were staying at your Hotel for a week. We would especially like to commend Dragana and Tim who made this a memorable evening for us - both we felt are huge assets to your Waiting staff and we would like to send you this review. But to also commend your excellent Evening Buffet which is at great price for both 2 and 3 courses. Thank you London West Novotel - 10 out 10 - for your evening Buffets Dinners. Although we didnâ€™t stay at this hotel we did use the car park. I would like to leave a review with regards to the car park booking. We had booked the car park via JustPark which is an authorised car park booking company for This particular hotel. On the day of parking the car we encountered problems with the actual barrier not opening and recognising our booking code which was the same for other JustPark customers, and this became extremely stressful when you also have a baby in the car crying. We pressed the help button and the hotel advised us not to worry and allowed us to park. We were able to come to a satisfactory resolution at the reception desk by the very kind staff member Keegan. We thank the hotel for being understanding and hospitable. These small things really make a big difference especially in such a busy town of London. Thank you so much for your feedback. I am glad to know that you had such a wonderful experience. I am going to share your comments with the team. They will be thrilled to know about your stay. We hope to welcome you back soon in the future. The hotel is located at a very convenient location, very close to Hammersmith station which connects 4 lines. Not far from several tourist attractions and a great location for travellers. The hotel is however quite tired and needs a refurbish. Carpets look old and bare. Cleaning also needs a lot of improvement, on arrival we saw that cups werenâ€™t washed cleanly and electric kettle was not clean. Breakfast spread was functional but could be better. Was lucky to get a room upgrade, so appreciative of that.